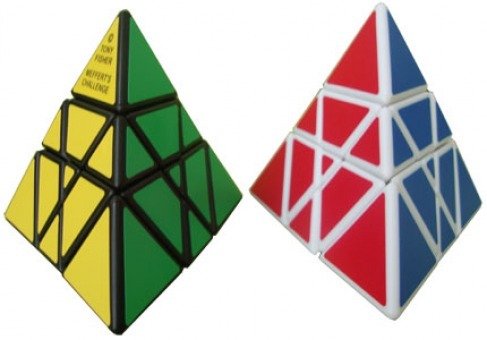 dimension to our Pyraminx which is still our best selling Puzzle until now. The Master Pyramorphinx was designed and first made by Tony Fisher. He completed his prototype on the 8th April 1991. At the time he didn’t really have a name for it and would refer to it as either 3x3x3 Tetrahedron or sometimes Tetrahedron Transformation of a Rubik’s Cube. That original puzzle was very large and heavy (unlike this one) though it turned reasonably well. One of the first things you will notice about this puzzle is when scrambled it usually does not retain it’s shape. Most of the time it will be a confusing jumble of parts. But this lets you make beautiful and unique shapes and patterns. This type of puzzle is commonly referred to as a shape shifter or Morphing puzzle. The Master Pyramorphinx is based on the Rubik’s Cube mechanism and is only slightly more difficult to solve. The 6 central edges are equivalent to Rubik’s Cube centers though on this puzzle they need to be correctly orientated. The 12 trapezium shaped pieces are equivalent to Rubik’s Cube edges. Positioning of these is not as strict though this can course parity errors. Exact orientation is vital. Both for the corners and centers of The Master Pyramorphinx which are equivalent to the 8 Rubik’s Cube corners. Exact positioning is vital though the four central triangles do not have a specific correct orientation. Once again this can lead to parity errors which adds an extra challenge.